"Hope none of them make it out alive." — Morgan Kinsano during the Second Ark Conflict. 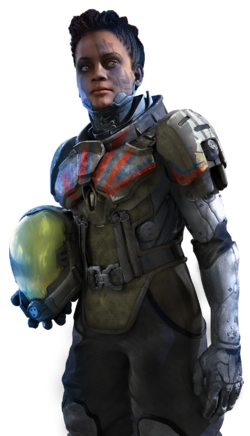 Lieutenant Colonel Morgan Kinsano is a Hellbringer of the UNSC Marine Corps stationed on the UNSC Spirit of Fire and a former insurrectionist. She leads the Firestorm Battle Group. Kinsano was a key insurrectionist leader in the Outer Colonies during the later years of the Insurrection. Shortly after the onset of the Human-Covenant War, many of her allies and family members were slaughtered by the Covenant while the insurrection movement scattered. This prompted Kinsano to enlist with the United Nations Space Command to fight the alien menace. As part of the UNSC Marines' Hellbringer corps, she eventually rose to the rank of lieutenant colonel, commanding the Firestorm Battle Group aboard the UNSC Spirit of Fire at the time the ship went missing in 2531, and later fought the Banished at the Forerunner Installation 00 during the Second Ark Conflict in 2559. Kinsano is known for her aggressive personality and fierce combat style. Despite her changed allegiances, she has not given up some of her former attitudes and politics, and her approach remains unorthodox by UNSC standards. However, she has also grown to respect Captain Cutter since joining the crew of the Spirit of Fire, and has saved many lives with her unconventional tactics. Morgan is known to armor herself unconventionally and to pattern both her armor and her face. She has short, black hair. In battle, Kinsano uses a modified Cyclops exoskeleton that is armed with dual M7057 flamethrowers. Kinsano is a DLC Leader released on March 21, 2017 for Halo Wars 2's multiplayer. Befitting her in-universe role, she specializes in flame-based weaponry. Early concept art of Kinsano. Blitz card of Kinsano's Cyclops in Halo Wars 2. Blitz art of one of Kinsano's abilities in Halo Wars 2. Kinsano and Hellbringers attacking a Banished Outpost. Morgan Kinsano's leader symbol as it appeared in Halo Wars 2 message of the day.